Treating ABS parts with acetone is almost as old as RepRap itself, but usually this has involved either dipping the part into liquid acetone, which causes white streaks in the parts, or brushing the acetone onto the part with a slurry mix, which can work very well but tends to be a messy process. 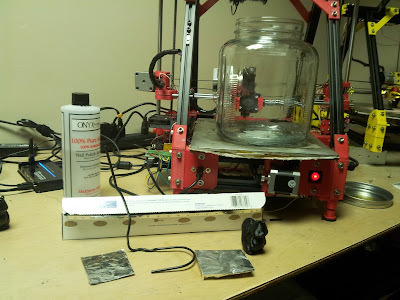 I have seen several setups out there, one by the Solidoodle Folks that involved a deep fryer, ice, tubing, and a candy thermometer, or completely passive systems that just used unheated acetone like TBuser of Makerbot did. Unforgettably I am a horrible mixture of cheap and impatient, so I had to figure out a way to do this for little or no money out of pocket. To do this process you will need your RepRap's Heated Build Plate (must be able to reach 110C), a Glass Jar, Some Aluminum Foil, and a hanger to bend into a hook to get the parts out with. First place your glass jar on the heated build plate and put a liberal amount of Acetone into the bottom of the jar (3-4mm deep). Initially you need to ramp up to 120C, especially if you have a heavy jar. As the jar comes up to temp you will see the meniscus from the edge of the vapor cloud slowly creeping up the jar. Once the vapor is to the top of the jar, turn the plate back down to 90C for the treatment. Place your sheet of aluminum on your table, and your part on the sheet. Lower the object into the vapor bath (very carefully, you don't want it falling off). 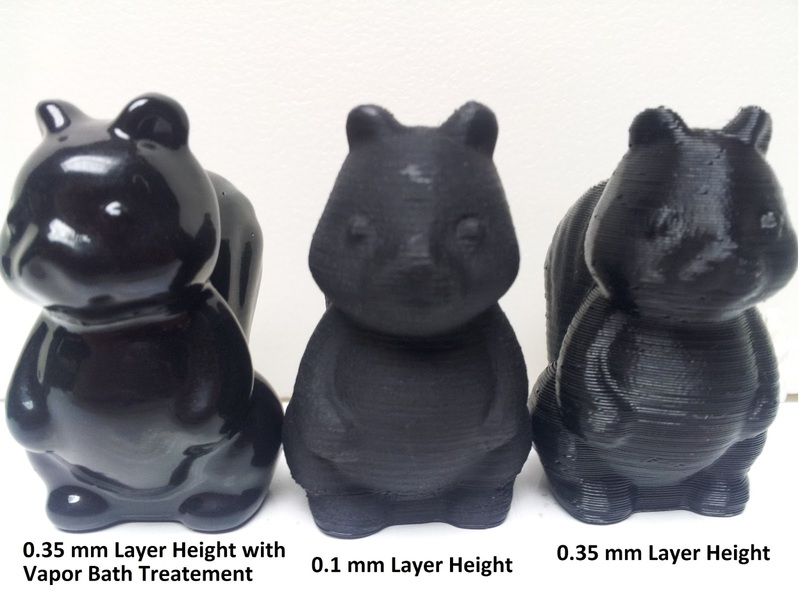 Leave the object in the acetone until you are happy with the amount of smoothing (the object continues to smooth out over the next few hours). Once the parts are in process you can not touch them at all, the easiest way we have found to get the parts in and out of the jar is to fold aluminum foil into a make shift table and use another smaller sheet of aluminum to act as a base for the part. You can fish the parts out of the jar using a wire coat hanger bent into a make shift flat hook. When done, carefully remove the object from the bath. If you're done processing put a lid on the jar loosely and as the vapor cools it will condence back into liquid to be stored in your acetone jar again. Allow the part to sit for another ten minutes, the surface will be very squishy while the residual acetone dries off. This was done at Fablocker in NC, USA. By Austin Wilson and Neil Underwood (Spacexula). 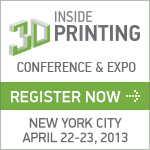 Come to the Inside 3D Printing event in New York City! The event runs from April 22-23 2013. We have arranged for reprappers (that's you!) to get a special 15% discount on admission - quote the code RRP15. With the increasing number of multi-colour RepRaps out there (Ahem! Including ours at RepRapPro Ltd...), it will also be possible to use them to print in mixtures of materials with different engineering properties. used as input was made by rolling and can also be seen. They used carbon as a filler, which works nicely, but gives rather high resistances. So we tried silver instead (expensive...) to get the resistance down. This didn't work very well because of the shape of the silver particles. The silver particles are flakes, and the carbon particles are fluffy and dendritic. We hypothesised that the shape of the carbon allows lots of particles to touch each other (or at least to conduct between them synapse-like by quantum tunneling), but gives the high resistance. So a mixture of the carbon to get the geometry of the particles right and silver to introduce short circuits between the carbon projections might work even better. There was also a problem with the silver when it came to contact resistance at the surface. It may be that the spiky carbon tends to stick out of the surface, whereas the flatter silver ends up with a plastic film over it. It seemed like mixing different conducting fillers may be the way to go. So we have tried experiments with a mixture of both silver and carbon, which seem to work better in combination than either on their own. 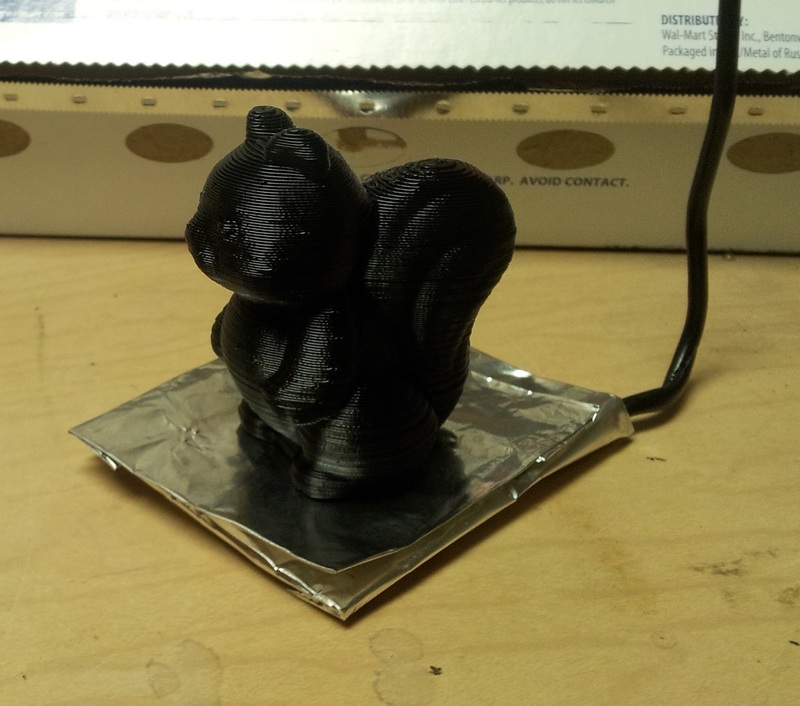 Full details can be downloaded from the RepRapPro Github repository here.